Forklift trucks are used in many different industries throughout the UK, and for a wide variety of purposes. Some of their most common uses include stacking shelves in warehouses, moving heavy loads throughout work premises, loading delivery lorries and accessing items stored at high levels. 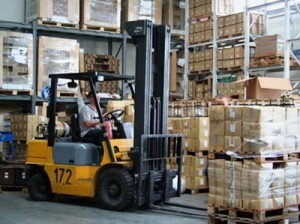 A large number of workers sustain serious injuries as a result of forklift accidents every year. Injuries can range from bruising, lacerations and concussions through to broken bones, crush injuries and serious spinal damage. The impact that these accidents can have on the injured person, as well as their family and friends, can be life changing. If you have suffered injuries following a forklift truck accident that was caused by somebody else’s negligence, you may be eligible to make a claim for accident compensation. Our solicitors have experienced in helping people with such cases and work closely with clients to build the strongest case possible. Our aim is to achieve the maximum compensation award possible for the injuries you have sustained and any financial losses you have incurred as a result. To find out if you have a valid claim for a forklift truck accident, contact us today for a free case assessment. One of our experienced and friendly solicitors will discuss your accident with you to determine if you may have a successful claim for compensation. Who can be held liable for a forklift truck accident? ensuring that forklift trucks are in good working conditions. This includes carrying out inspections on a regular basis. If your employer has failed in his duty of care and you have suffered injuries in an accident that could have been prevented, you may be able to hold the employer responsible your injuries. If it can be established that the employer was negligent, he will be liable to pay you compensation for the pain and damages that you have suffered. According to research conducted by the Forklift Truck Association, 43 people on average are injured in fork lift accidents each and every week in the UK. Tragically, this research also highlights that one worker is killed as a result of a forklift truck accident every six weeks. The vast majority of these accidents could be prevented if health and safety measures are taken and adequate training is provided and observed. 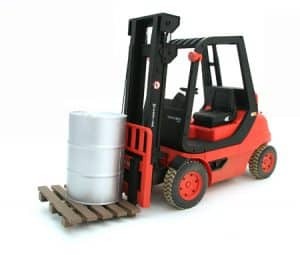 Tipping over – if the forklift truck is overloaded, there is an increased chance of the vehicle overturning, and this can crush or cause injury to anybody nearby, as well as causing injuries to the driver. Forklifts can also overturn when heavy loads are transported at dangerous heights, when driving too fast around corners and when driving on slopes that are too steep. Falling objects – forklift operators and people working in close proximity can be at risk of serious injury from falling objects. This could be as a result of an incorrectly balanced load, knocking items from shelving or when transporting loads over uneven surfaces. Pedestrian accidents – approximately two thirds of injuries caused by forklift truck accidents are sustained by people other than the drivers. Lack of safety systems, faulty signal alarms, and careless operators can all lead to accidents involving pedestrians. Collisions – colliding into other vehicles, shelving, walls and pedestrians can all cause serious injuries and even fatalities. These type of accidents can be caused by a lack of training, driver error, poor or lack of safety procedures and faulty machinery. Driver ejection – this usually happens in a stand-up forklift truck where the driver does not have armrests or seatbelts for protection. However, it is essential that these kinds of forklift trucks are equipped with safety features such as an operator compartment door so that the operator is safe when the vehicle is in motion. Can I make a claim following a forklift truck accident? If you have been involved in a forklift truck accident that was not your fault within the last three years, and you sustained an injury due to this accident, you should be entitled to make a claim for compensation. Our experienced team of solicitors have knowledge in the causes and damages that such accidents involve and we will work closely with you to try to achieve the maximum possible compensation award for your injuries. In order to build a strong case and seek out the highest settlement possible, we will prove the liability of the accident, in other words, who was responsible for the incident and the severity of any injuries that you suffer. Our solicitors offer clients the opportunity to receive their expert advice and detailed skill on a no win, no fee basis. This means that you do not need to make any financial outlay before winning your case. Our solicitors will only receive their fee upon the successful completion of your accident claim. If they fail to win your claim, you won’t pay them a penny. Our no win no fee service means that you can concentrate on recovering from your injuries, without the worry and financial burden of having to fund your claim. We firmly believe that you should not have to put up with further financial expenses in your pursuit of gaining the compensation that you rightly deserve. Our promise of a genuine no win, no fee service helps us to meet this commitment. How much compensation will I be awarded for my injuries? General damages – this is an award of compensation for the injury or injuries that you have suffered, and the impact that these have had on your life. This takes into account the type and severity of the injury, with industry guidelines being provided by the Judicial Studies Board. Special damages – as well as for the actual injury sustained, compensation can also be awarded for any financial losses you have suffered as a result of your accident. 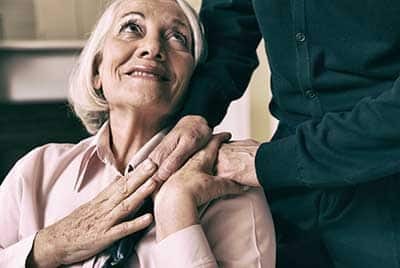 The biggest consideration here is usually loss of earnings in cases where you may have had to take time off work, but can also include the cost of medical treatment, transport costs, and other related financial losses. Can my employer sack me for making a claim following an accident at work? It is illegal for your employer to sack you or make your working life uncomfortable purely on the basis of you having made a claim following a forklift truck accident. If you were dismissed on these grounds, it would most likely amount to an unfair dismissal, which would make your employer liable for further claims in an Employment Tribunal. In most cases an employer that has been subjected to a work accident claim will take action to improve the safety of the workplace and safeguard their employees from similar accidents in the future.